Poop. It’s a word that makes little kids giggle mischievously. And it’s something that your chickens produce a lot of. Instead of viewing it as undesirable side effect of your backyard chicken hobby, change your paradigm and recognize chicken manure for what it is: A literally transformational, nutrient-rich substance that can work wonders in your garden and add a magical boost to your landscape. 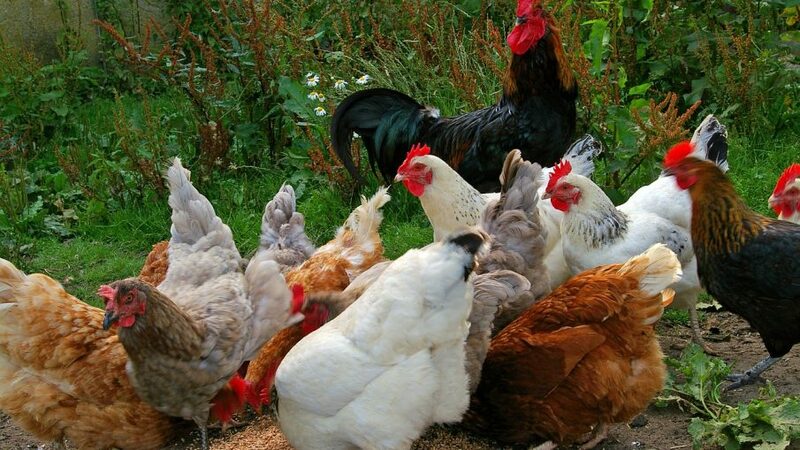 Why Use Chicken Manure as a Garden Fertilizer? Poultry manure has long been recognized as perhaps the most desirable of…natural fertilizers because of its high nitrogen content. In addition, manures supply other essential nutrients and serve as a soil amendment by adding organic matter.Â Organic matter in soil improves water and nutrient retention. The use of manure is an integral part of sustainable agriculture. Just like commercially prepared synthetic fertilizers, chicken manure is very high in nutrients. The combined average percentages (per total weight) of aged chicken manure and litter â yes, you can use old litter from your chicken coop as a fertilizer! â is approximately 1.8 nitrogen, 1.5 phosphate, and 0.8 for potash. Using Chicken Manure as Fertilizer: How Much Should You Use in Your Garden? An annual application of 45 pounds of chicken manure and chicken litter, or more, per year for every 100 square feet will be just right to work wonders in your vegetable garden and increase the fertility of your soil. 45 pounds is the approximate amount that one hen will produce every year. Thus, the average small-scale chicken flock of 5-10 chickens should be enough to take care of your entire vegetable garden and yard! 1) Never feed fresh chicken manure to young, tender plants! Fresh chicken manure is “hot,” meaning it is very high in nitrogen and will “burn” the growing plants. This will kill your plants! Also, too much nitrogen can produce negative plant growth. This is why you need to age your chicken manure! 2) Poultry manure makes a great addition to compost! I recently received an “Earth Machine” composting bin as part of my local county government’s initiative to reduce green waste in Hawaii’s landfills. Although you do not need a “real” composter to compost, it can save you time. Whether or not you use an actual composter, any sort of composting converts nitrogen into a form that a plant can use without being burned. Composting also destroys the coccidia bacteria (a chicken disease), bacteria, worm eggs, and viruses, and stabilizes potash and nitrogen levels. Any composter will do, from the fancy type you see in Organic Gardening magazine, to simple homemade bins made of 2x4s and chicken wire. Important note: Manure that is composted without carbon-based material (such as dry grass clippings) will overheat. 3) Give chicken manure time to age by spreading fresh poultry manure over your soil and turning the dirt at the end of the growing season to allow it time to decompose over the winter. However, you’ll be required to keep your poultry birds out of the area for at least a year, preferably more. You can also try making “tea”. Chicken manure fertilizer tea; sounds delicious, eh? To make fertilizer tea, scoop the chicken manure into a burlap bag. Then, throw a rock into the bag to weigh it down and place the whole thing into a 35-gallon garbage can. Fill the garbage can with water and let it sit for about three weeks. Once the three weeks are over, you will have nutrient-rich chicken manure fertilizer tea as the water becomes infused with the nutrients from the chicken manure. You can use this fertilizer tea to water your plants to give them a vitamin boost. Your plants will love you for it. Here’s to bigger tomatoes! When making ‘tea’ does the manure have to be composted first or can I use fresh from the coop? Have you been involved in the production of this on a larger scale. We have 100,000 chickens and am looking at this in Ireland. If you are interested in discussing your project, please contact Michael LaBelle at growbig@mightygrow.com. I am the R&D director for MightyGrow Organics and have quite a bit of experience in large scale fertilizer production. it is feasible to produce large scale compost with chicken manure, but professional machines such as in-vessel composting machines, or windrow turners are needed to achieve commercial compost production and promise the high quality of finished products. Thanks for this info.. many years ago i was on a farm and we used to put the poop into water and then spread it on the vege garden (because the fresh poop burns the veges). I couldn’t remember how to do it or how long to leave it “brew”.. so this site is refreshing. Kerry Lowe – from what i recall there was no need to compost – it was purely scrape up the poop and chuck it in the water, and then let it “brew”. we didn’t use a bag either, but we did skim from the surface of the drum (we used a 44gallon drum). Ryan- i’m not sure for mass production, but i don’t see why it woudln’t be viable. I just saw in the process of googling, that one huge company in Australia, that has tonnes of chook poop a day, has created a fertilizer brand. As with every commodity they have added extra ingredients to their “recipe”, and are marketing it bottled. I didn’t realise until watching it on you tube what a drama chook poop can be for commercial chicken farmers. Hello, I have just put a load of chicken manure into my newly made veggie garden to help create good soil before planting. I believe the manure is a few months old. I put in about 15-20% manure. Should I let this sit before planting to avoid burning my seedlings or am I ok to get started? When making the “tea” you do not have to compost it. For optimum nutrients on a larger scale, 20lbs of fresh or old manure to 32 gallons water. Wait the 3 weeks for peak Nutes – But after making the tea as above… Dilute it by FOUR (by adding water). Yes this makes ALOT. cut recipe in half for backyard use but during studies it was the 20lb “tea” bags that made the best brews. I have started new Egg trading Office in Namakkal & doing wholesale egg business. We do direct procurement of eggs from the farmer & i came to know that they have lot of Chicken Manure in farm. 1. How can i promote on sell the Chicken Manure? 2. To whom i need to approach. 3. What will be cost of 1tonne of Chicken Manure? how did your enterprise work out? could you please help me by sending the instruction and guidelines how to use the chicken manure to fertilize the hay product using the (( Cleris Ac10000 ) , ( 3 ) pcs. )) and (( Rabe MegaSeed 6002 K2 ( 2 ) pcs . )) , these guidelines must be from the begging to the end and what is the process shall I follow and what are the equipment shall I use ( step by step ). We’re you able to get any info on this? I am very interested in making this liquid fertilizer for our local farmers. I live in the Caribbean and think this would be great for a cost effective method of planting. Would love the step by step instructions on how to make it with the 20 lb bag… And what ingredients I would need to perfect this? Thank you, I’ve been hunting for details about this topic for ages and yours is the best I have discovered so far. I’m just waiting for my chicken manure to brew which I followed the directions on your site. How often can I water my garden once my brew is done in three weeks? Kirsten, you are dead-on! It is as much of an art as it is science. And all of the litlte things you described that are needed? Each of those require dedication. That’s essentially what it boils down to the dedication of us as fund raisers to learn what our donors need. Good luck with your plantings! Not quite sure how you came up with “45 pounds per 100 feet” but that is WAY TOO MUCH! That works out to 9.8 tons per acre or 588 pounds of nitrogen per acre. My company, MightyGrow Organics, processes poultry manure into an easy to use, pelletized organic fertilizer, so I know a little bit about chicken manure and its uses in agriculture. On average (depending on soil test results) 1-2 tons per acre is PLENTY. The most I have ever recommended as 5 tons per acre and that was for growing onions/carrots, which take a LOT of fertilizer. Chicken manure contains a lot of phosphorous, which doesn’t move in the soil and is taken up by the plants at a lower rate than either nitrogen or potash, so excessive application of chicken manure will build up in the soil, causing future problems. As far as composting chicken litter, you MUST add “browns” to the mix, such as hay, wood chips, leaves etc. Otherwise the compost will NOT heat up, since the bacteria need carbon to multiply. Finally, when making manure tea, the key is oxygen. You can place 1-2 pounds of finely ground chicken manure into a bucket of water along with an air stone to supply oxygen so the material will break down correctly. Use as a diluted liquid fertilizer at the rate of 1-2 ounces per gallon of water. I made liquid chicken compost early this year but didn’t use all of it. Is it still benficial to my plants or has it passed its usable date? Thank you for this necessary information. God bless. Chicken manure is a kind of high quality organic fertilizer rich in various nutrients, including pure nitrogen (about 1.63%), phosphorus element (about 1.54%) and potassium element (about 0.85%). Before used as fertilizer in cropland, the chicken manure should be well decomposed so that the parasite, spawn and some germs existing in the chicken manure can be killed during the decomposition process. Because the chicken manure can produce high temperature in the process of decomposition, which leads to the damage of nitrogen element, so the fertilizer efficiency will be better to add appropriate amount of water along with 5% calcium phosphate before composing. After fully decomposing, chicken manure will be considered as high quality base fertilizer for grow crops or as fertilizer applied at winter for fruit plants throughout the year. Hi, thank you for sharing this information. You are quite right, chicken manure and poultry litter can act as a brilliant organic fertiliser as I have used it myself! It can have a real positive impact on your soil quality and crop growth. Also, I have been doing some reading online as an avid organic farmer and there are many other ways that you can look at improving your soil quality. This article I stumbled across shares some top tips that I thought might be useful for some of the people on this site! Let me know if it was and if anyone has any tips of their own also that they’d like to share!